Written by Janet Choi on March 3, 2016 . Chip and Dan Heath tell this story in Made to Stick to illustrate the power of concreteness, how decision-making can be easier when guided by specific experiences. For Melissa, actually seeing moms in their homes delivered insights into the value of predictability and convenience for mothers and the kids they were feeding, over the extensive variety the company had been pushing. After simplifying the product line and adapting the ads, sales of Hamburger Helper increased by 11%. In email marketing, it’s easy to deliver death by confusing abstractions or to take haphazard stabs at what we think will motivate. Instead we can educate, nurture, and convince much more effectively by using concreteness. Even when meaning and level of detail are the same, as in these Hamburg bridge descriptions, subtle linguistic framing makes a meaningful difference in how the information is digested. “Linguistic concreteness makes the described situations more imaginable,” Hansen and Wänke write. “Increased imaginability, in turn, causes people to believe the statements with greater likelihood.” Framing the information as an experience that the reader is performing instead of plainly stating the fact that Hamburg has the most bridges in Europe feels more concrete, and so, adds credibility and persuasiveness. Concrete language also paves the way for easier judgment calls and decisions. Because people can imagine and believe concrete statements, they can also envision outcomes and feel more comfortable making decisions towards those outcomes. For instance, researchers found that using more concrete language like “one share of IBM stock” rather than a generic “asset” in disclosures increased investors’ willingness to invest in a firm. The researchers also found that highlighting concrete language reduces feelings of psychological distance. If you’re not familiar with something, confusing jargon, vague generalities, and abstract ideas end up becoming reasons to lose interest. 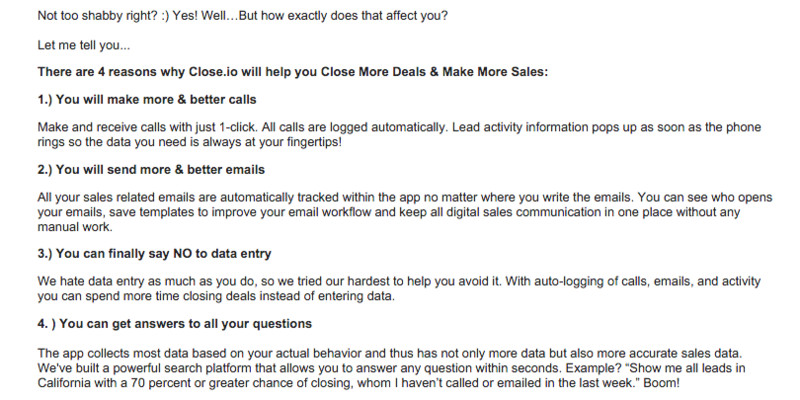 In email of course, those are immediate reasons to unsubscribe, delete, ignore, or even spam. Concreteness offers a bridge of believability and affinity to cross over and explore new things. To aim for concreteness, then, use more descriptive and interpretive action verbs and hold off on the adjectives. Since concreteness helps close gaps with psychological distance, it’s especially useful when you’re dealing with newness — new users or audience members, new features, and other types of new situations. Concreteness, funnily enough, is your welcoming, pillowy soft landing for your readers’ minds. 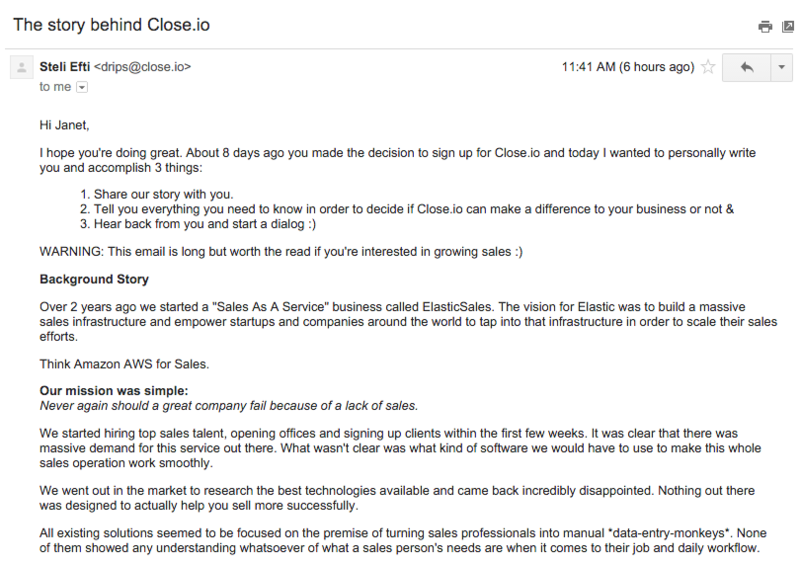 Close.io About a week after a new app signup for Close.io, a sales CRM tool, they trigger a very long email from CEO Steli Efti. Click for full, epic email Why does this message clock in at over 1,000 words? It’s sharing many stories, all designed to build a bridge to the reader and hopefully ferry them over closer to activation and engagement. Instead of saying something like “Get started because Close.io is the best!” — Steli shows you why with a resonating origin story. You learn that the Close.io team is solving a pain they had experienced firsthand. That’s why the specific descriptions of existing solutions that turn people into “manual data-entry-monkeys” feels magnetic. They’ve walked in your shoes, their product started out as their own secret sales sauce — this is Close.io’s version of showing that they’ve been in moms’ kitchens and understand their needs. 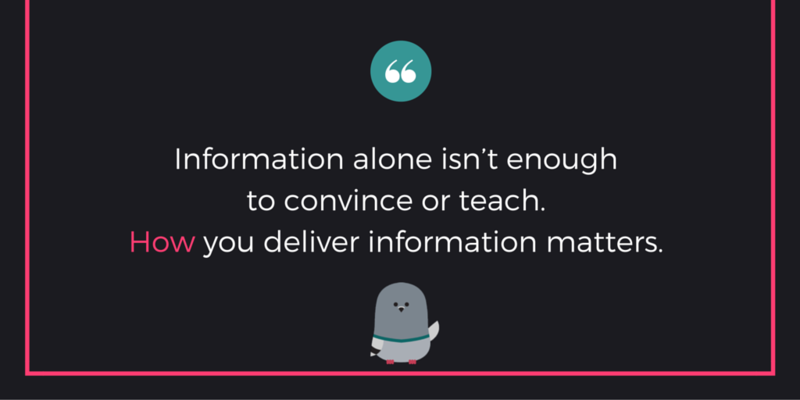 After testimonial quotes from real-life happy customers, Steli brings the focus back to you. Envision your future — you’ll make better calls and emails, escape the data-entry monkey zoolife, and gain sales data insights — and here are all the details on how that all comes into existence. Casetext Casetext is a handy platform for legal writing, research, and publication. Their mission is to make legal knowledge and resources free and understandable. 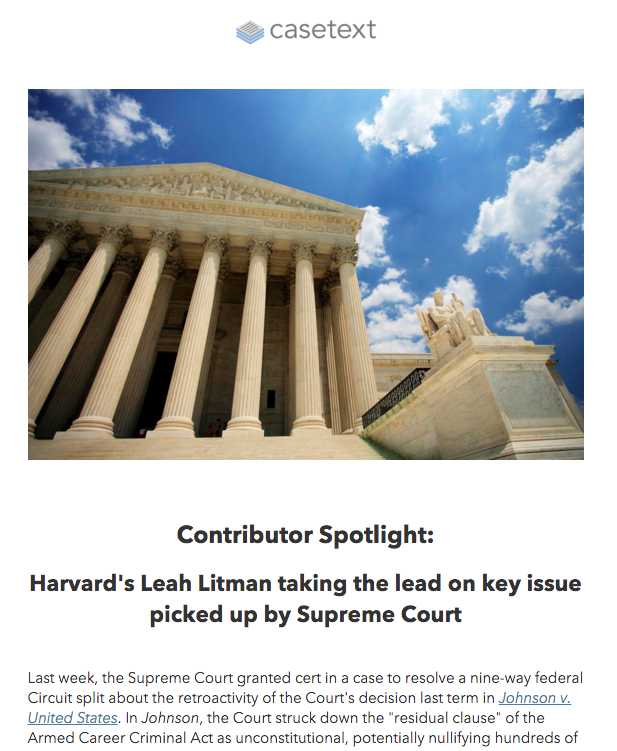 Here’s an email Casetext sent out about one of its contributors Leah Litman, who has written about retroactivity of a law affecting convictions. 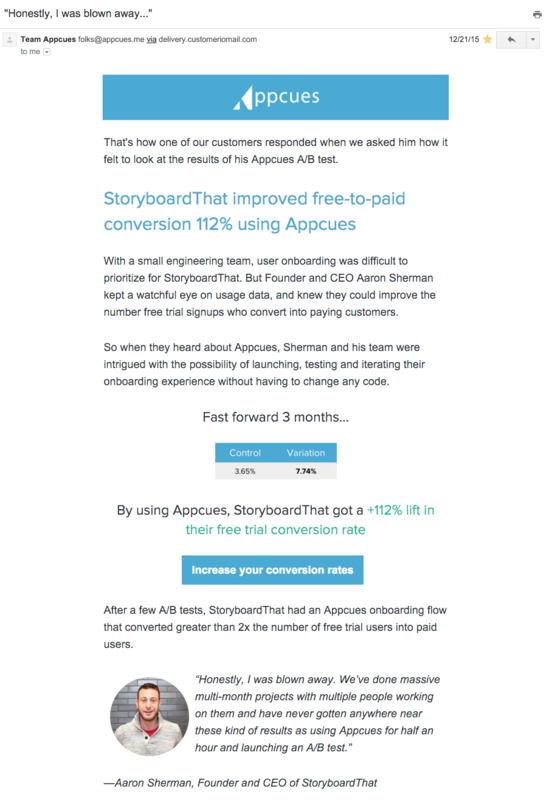 Click for full email The email highlights one specific company, StoryboardThat, and the specific successes — 112% increase in conversions! — they had using Appcues. This is a story that will resonate with Appcues’s target audience: here’s a real-life small team that has to deal with many competing priorities but wanted to make their user onboarding more effective. 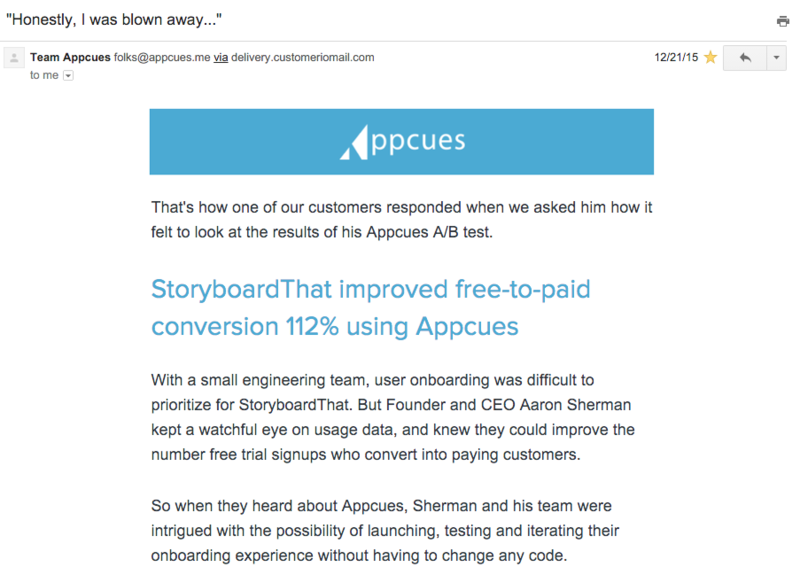 Here is what actually happened after they starting using Appcues, including this impressive A/B test result that blew the customer away. Their call-to-action button copy is on point too. Even though the link simply takes you into the app, the message is not about signing in or checking Appcues out. Instead, it’s about the very clearly defined goal that the reader has: increase your conversion rate. Finally, the Appcues team includes the picture of the person featured in the story, which makes it easier to see and understand who was impacted. 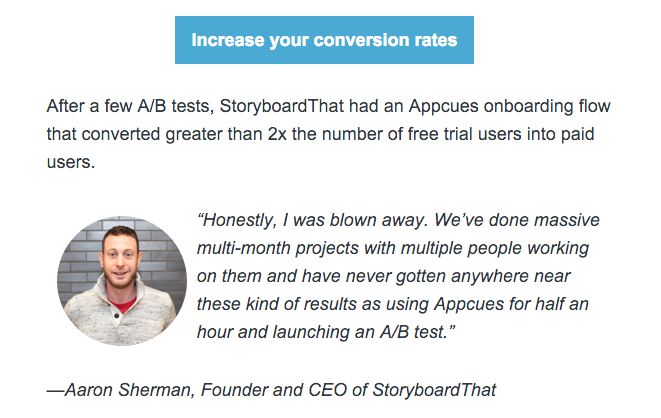 Aaron is a real person, very much like you, who wants to increase conversion rates without having to wrangle a bunch of code.